One of the great creative and spiritual encounters in American history took place under a shelter of pine boughs on a barren hill on the Pine Ridge reservation in the summer of 1930. The men who met that day were John G. Neihardt, a renowned poet and critic from Nebraska, and the Lakota holy man Black Elk. Neihardt was engaged in writing “The Song of the Messiah”, the last narrative poem in his epic Cycle of the West. He was eager to talk to an elder who had been warrior and healer, hunter and seer, who had worn the Ghost Dance shirt, survived the massacre at Wounded Knee, and lived the brave and tragic history of his people from the slaughter of the buffalo through victory at Little Bighorn and the massacre at Wounded Knee. The government agent at Pine Ridge, an admirer of Neihardt’s work, had arranged an interview, describing the “old Sioux” as a “kind of preacher”, a wichasa wakon (holy man). Neihardt’s Lakota interpreter, Flying Hawk, counseled him not to get his hopes up about the interview. Black Elk, now almost blind, was reclusive and reluctant to talk about sacred things; he had turned away another writer the week before and might simply refuse to see Neihardt..
Black Elk was not mistaken. Both men had received their calling in dreams and visions, and they immediately recognized that in each other. Black Elk placed a power object, representing the Morning Star, round Neihardt’s neck, and started talking about a “power-vision” from his boyhood. 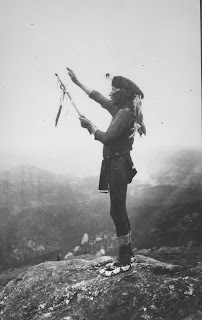 When he was just nine years old, the Lakota fell into a trance on Harney Peak and saw the sacred hoop of the world, and the tree of life, and the powers of the six directions. I was standing on the highest mountain of them all, and round about beneath me was the whole hoop of the world. And while I stood there I saw more than I can tell and I understood more than I saw; for I was seeing in a sacred manner the shapes of all things in the spirit, and the shape of all shapes as they must live together like one being. On the first conversation with Neihardt, Black Elk gave only “flashes” of what the vision contained. But he invited the poet to come back in the spring to receive it all. He announced that his purpose was to “save his Great Vision for men”; he had chosen Neihardt to be his “word sender”, the one who would take his story from one language and mindset and root it in another, so the world could hear and awaken. Neihardt was ready to understand and interpret, not only because he had studied Native American traditions for thirty years, but because he was a dreamer whose life had been shaped by a big dream in his boyhood. Aged 11, on his own “hill of vision” in Nebraska, Neihardt lay in a fever. Three times during the same night, he felt himself hurled through a vast emptiness at terrifying speed, his arms stretched forward, while a great voice drove him on. He interpreted the dream as a mandate for his life calling: to follow a higher purpose that he would manifest through poetry. Two decades later, Neihardt wrote of his encounter with the voice of the fever dreams in a poem titled “The Ghostly Brother”. Here he presents the driving force of the dream as a greater self or daimon that tells him, “I am you and you are I.” The poem speaks of the tension between a power that calls him to travel “somewhere out of time and place” beyond “the outer walls of sense” and the everyday self that wants safety and comfort and rest. Neihardt felt shivers of recognition when Black Elk got to the point in his narrative – the following spring – where he described himself flying through space, in a vision when he was in Paris with a Wild West show, in the same style as the 11-year-old poet. From the conversations between the two dreamers came an essential and perennial classic of Native American spirituality, Black Elk Speaks, first published in 1932 and now available from Excelsior Editions (an imprint of SUNY Press) in a handsome annotated edition with illustrations by Standing Bear. The subtitle of the book speaks of the depth of creative collaboration the Lakota holy man and the poet achieved: Being the Life Story of a Holy Man of the Oglala Sioux as told through John G. Neihardt (Flaming Rainbow). In the Mohawk language, which I was required to study because of my own dreams and visions, the word for “interpreter” (sakowennakarahtats) carries the sense of transplanting something from one place to another. This Neihardt accomplished. In his work with Black Elk, as he again wrote near the close of his life, he was convinced that “there were times when we had more than the ordinary means of communication.” I am sure of it. Dreamers know each other, and where people value dreaming, the right dream is a passport to essential things, which are shared on more than one level of consciousness. What a remarkable story! Neihardt’s, like you, was ill with a fever at age eleven when he had his vision. That seems like a recurring theme; childhood illness thins the veil? Or the coming vision sickens the child? I would say the first one, as in adulthood. Thanks Robert for sharing about Neihardt's story!